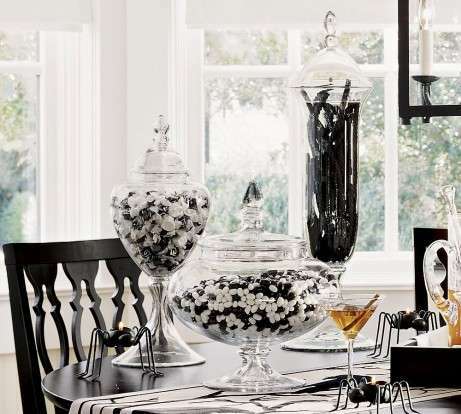 Throw the classiest Halloween party ever, on the cheap. You can always save the decorations for your future spooky goth wedding. Chalkboard paint might work, too. Maybe throw in a silver one for effect. This mirror was painted with flat grey paint and chalkboard paint. This one is just white string threaded through small black pom poms. Here's a simple one using black string and handmade yarn pom poms. Just take a twig wreath and spraypaint it black. These are $32 each from Olive and Cocoa. For a cheaper option, Pottery Barn has mini black skull candles for only $6 apiece. Get the instructions for this DIY here. Photography by Rebecca Hansen Weddings. Get the tutorial here. Originally seen in Sweet Paul. All you need is some black lace trim from any craft store. Take some plastic bats from any Halloween supply store and give them a light coat of white paint. These were for sale at Horchow, but you could easily DIY some for a creepy Victorian vibe. These were made using iron-on transfers. Get it from Etsy for $15.